What drives trust in market research, and how is it changing in different markets? With the help of some fresh data from GfK’s Trust Index, Phyllis Macfarlane looks at how the profession is perceived and how that affects the entire industry. ?Trust is one of those words that, the more you think about it, the less you understand what it really means. ‘A brand I can trust’ is always a key correlate with a customer’s level of satisfaction, but simply advising clients that they’ve got to build trust in their brand is not particularly helpful or actionable. IBM boss Thomas J Watson said: “The toughest thing about the power of trust is that it’s very difficult to build and very easy to destroy. The essence of trust building is to emphasise the similarities between you and the customer.” We can all agree with the first sentence, but the second? I’m not sure that Watson has exactly nailed the solution. When faced with the results of an international survey about how much the general public trust market researchers as a profession, naturally we are interested. Not only is it always interesting to know what people think of you and how you compare with others, it’s also very important for us, because levels of trust in market researchers must have an influence on response rates, and whether honest and thoughtful answers are given to surveys – things that we researchers want from the general public. What lessons of value to the industry can we learn from the varying and changing levels of trust? GfK has been measuring the trust of the general public in various professions since 2003, and recently added market researchers, advertising professionals and marketing professionals to the standard list that includes doctors, bankers, teachers, the police and so on. But before looking at the data it’s worth considering what exactly ‘trust’ means in this context. A simple definition is that trust means making an exchange with someone when you do not have full knowledge about them, their intent, and the things they are offering you. Is trusting a profession as a whole the same as trusting an individual or a brand? I guess that, in the main, it is. If you trust a group of people as a whole it means you expect them to be fair, honest, and straightforward in their dealings with you, not to take advantage of you or mislead you in any way. Since most members of the general public will have little or no personal knowledge of market researchers, we’re measuring a perception – but how is that perception developing and changing? 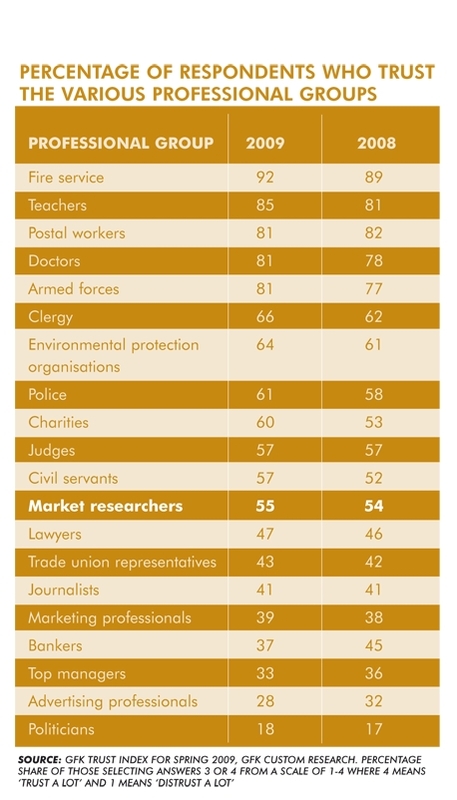 Our survey (see table below) showed that market researchers fall midway in the list of professions – well below teachers and doctors but above lawyers, journalists, marketing and advertising professionals, and (fortunately) well above bankers and politicians. Levels of trust have not declined, contrary to expectation. They are consistent over time. My first hypothesis was that trust is the sort of variable that must be falling off everywhere. In these cynical times, surely everyone has lost faith in the professions? But no – the evidence is to the contrary. If you look at a standard set of professions (before research, advertising and marketing were added), levels of trust have been constant over the last five years, both globally and in western Europe. In eastern European countries levels of trust have increased between 2003 and 2009. There are some exceptions (e.g. Greece) where general levels have fallen – but otherwise the average levels are remarkably constant. Levels of trust are consistent across countries, so we can take the differences between the countries for market researchers as a reflection of the relative perception of the MR profession in those countries. The average level of trust across the standard list of professions is pretty consistent between countries – generally in the high 50s or low 60s. 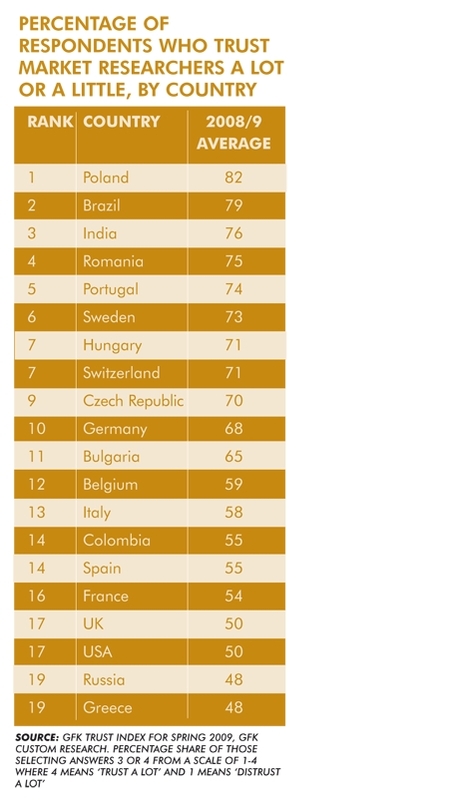 Greece is low (below 50 ), and France and Italy are in the low 50s, but the UK is in the high 50s, as is the US, so it seems that trust is a value that measures consistently across countries. There appear to be two main groupings of professions: the ‘generally trusted’ and the ‘definitely less trusted’. You might almost call them the ‘authentic’ professions and the ‘spin’ professions. Interestingly, market research sits between the two when averaged across all countries, but there are interesting differences between countries. Having decided that we can compare overall levels of trust across countries, let’s now look at how the level varies for market researchers (see table below). In general, market research is a more trusted profession in eastern Europe and emerging markets than in western Europe, and western Europe has higher scores than the US. The UK results are towards the bottom end of the western Europe results, and closer to the US scores. Why is the level of trust in market researchers so different in different countries? I think it goes back to those two profession segments: ‘authentic’ and ‘spin’. In the emerging markets market research is more associated with the economy, business and academia. In these markets, academia is respected, and the economy and business are growing. This is good, and therefore market research tends to have a score similar to the ‘authentic’ group of professions. Brazil is a good example. Its high score reflects a generally wealthy and growing economy and a growing market research industry, which has developed a serious positioning in the economy. However, in more mature markets there’s much more cynicism about business in general, the public is more aware of how marketing and advertising works, and market research is more commercial and often associated with annoying direct sales calls. In these markets, MR becomes more closely associated with the ‘spin’ group of professions, and trust in the profession is consequently lower. The fact that the UK and the US (arguably the two most mature markets) are towards the bottom of the table is a serious concern. These are the world’s largest MR markets, and it seems that we have allowed ourselves to become more associated with ‘spin’ than with the ‘authentic’ professions – which is probably not a good thing. Let’s now look at how the level of trust changes year on year, and think about what might be driving change (see table below). I asked GfK’s country managing directors why there should be such strong swings in some countries, and one key driver of movement seems to be the political polls – their accuracy and how they are used by politicians and the media. Polls may not be big business in a revenue sense but they do appear to have a very high impact on public perception. For example, the excellent improvement in Portugal is thought to be due to the quality of its exit polls. In Spain, where the polls have been accurate for elections in 2008 and 2009, results also improved. In India, where polls were wide of the mark for the last election, there was a decline of 9%. In Romania, where parliamentary elections took place in the autumn of 2008, trust declined from 78% to 71%. Poll results were said to have been misused by politicians to talk competitors down and, as trust in politicians in Romania is extremely low in general, perception of the research profession was affected. In the Czech Republic politicians tend to defer to public opinion by taking the top three to five important issues identified from the polls and using them in their campaigns and policies. The general public thus gains the impression that politicians are following their advice, improving the general perception of market research. Another explanation is that in the emerging markets, for example Colombia, levels of trust have increased because market research there is growing and becoming more mature, there is more information and knowledge about it. These are anecdotal explanations but they ring true. The general agreement is that public perception is strongly influenced by political polls and sometimes media measurement (particularly TV ratings), which gets a lot of exposure in countries such as Greece where it is frequently questioned by the media. we should support our associations in promoting the image of the industry and do all we can personally to promote market research and demonstrate its real value to the economy. Trust is an issue that should concern every branch of the research business. If you want to debate this topic with other researchers visit Research’s new discussion forum at www.research-live.com/forums. I'm wondering if how we primarily practice our profession in each country also has some level of effect here? Where research is still done primarily face to face there's probably more of a trusting relationship between MR and the public versus where we've moved away from having real conversations and shoved research into self-administered methodologies which is primarily the US and UK which seem to be the most at risk here. Hard to tell from some of these tables and clearly there's some f2f countries at the bottom but I would bet that an interviewer with an industry approved badge might be a more positive "role model" than someone ringing the house or an email invite. I also think it's tough for MR to be in the mix of professions that are asked about. From a very early age we are told to trust policemen and firemen and we have daily relationships with teachers. One may not even come across a market researcher until we are 18+ well-after we've made opinions about other professions. Good piece of research though and one that our national industry organizations shouldn't ignore as well as all of us individually.